The Sister Patricia Chelius Distinguished Service Award is presented to an individual annually who both by word and deed have enriched the lives of the students of St. Francis de Sales Catholic Academy. Sister Patricia Chelius, a member of the Sisters of St. Joseph, received her Bachelor’s Degree from Brentwood College. She earned both her Master’s Degree and New York State Certification in Administration and Supervision from Fordham University. During her teaching career, Sister taught Grades 1, 3, 4 and 7 in various schools in the Brooklyn Diocese including Our Lady of Perpetual Help and St. James in Brooklyn, and Holy Child Jesus and St. Benedict Joseph in Richmond Hill. 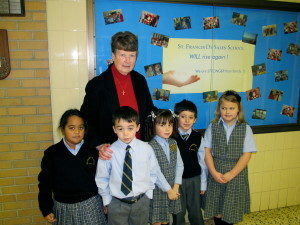 Sister’s last teaching assignment was here at St. Francis de Sales School. After teaching Grade 4 for eight years, Sister Patricia became Principal of our school and proudly served in that role for twenty-four years.